As an artist, I am familiar with that nagging question that every artist must ask themselves- what is the purpose of my art and why do I do it? Many writers have probed this question- Tolstoy wrote a book called, What is the meaning of Art ? ; Emerson dealt with it in his essay on Nature; Solzhenitsyn confronted it in his Nobel Prize essay, A World Split Apart; Dostoevsky touched upon it in his address before the Pushkin Memorial; Gaston Bachelard touches upon it when he explores the phenomenology of the imagination; and it shows up in countless other works by Baudelaire, Delacroix, Robert Creeley, Walt Whitman and Rainer Marie Rilke. It is entirely unavoidable. One is compelled to ask this question. 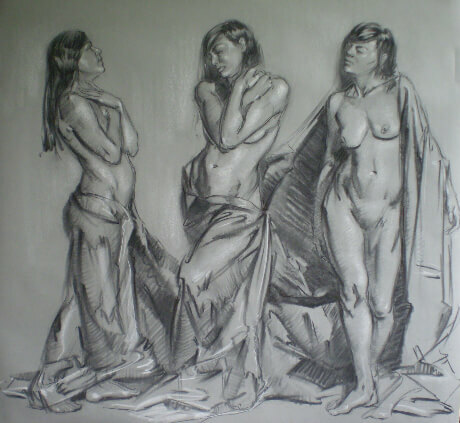 In a sense a painter or visual artist works this out by what they choose to depict and the method used. Monet was intrigued by the momentary flashes of life that came before his eyes. He chose to paint landscapes with a broken sense of color and lack of outline to convey this feeling of transience. Much hinges on finding the inherent meaning of one’s work and committing oneself to it- letting it become the raison d’être of one’s being. Rainer Marie Rilke explores the purpose of poetry as well as art. I first fell in love with his writing through his biography of Augustus Rodin. It took me years to find an English translation in a used bookstore. In Rodin, who was working on the Gates of Hell at the time, he found the perfect counterpart to himself- both tireless craftsmen seeking to transform the living vitality of existence into works of art. In Rodin, Rilke describes Rodin’s Balzac, Victor Hugo and The Burgers of Calais as work “…not to beautify or give characteristic expression, but to separate the lasting from the transitory, to sit in judgement, to be just.” The process of transformation from the visible to its inner equivalents was the greatest thing this world had to offer (Lemont) and Rilke observed it quite clearly in the work of Rodin. It is easy to ignore the incredible Beauty of all things. “The purpose of art is to express the good, the true and the beautiful” as Dostoevsky expressed it. But Solzhenitsyn believed that possibly only beauty will remain. The artist’s job is to praise and declare again the inherent value of all things and to say it again with intensity. “O tell us, Poet, what you do? – I praise. I like both the text and the figure drawing. Something like a transcendent (web) page. Hi Judith, very nice blog. I was looking for definitions around the purpose of art and came across your comments. In James Joyce’s Portrait of an Artist he comments that “Static” art as he calls it, is the highest form, because it arrests one, perhaps as if to put one in to a state of wonder and awe and connection. Interesting discussion. You might be interested in a video installation/single-channel work of mine “art is” in which I record artists/poets/musicians saying what it is — see http://www.quasha.com/art-is — it’s sort of a back-burner project yet I’ve recorded over 800 artists in 11 countries, on the fly, as it were. One day soon I’ll be posting translations (transpositions) of the Rilke’s Elegies from years ago — recently I’ve been returning to them. This one statement says it all. Brava. Love the drawing Judith. It makes me think of the idea or image taking form and revealing its self. Very beautiful. Inspiring words Judith. The quote “… oh to say them more intensely than the things themselves ever dreamed of existing.” is how I feel about your work it often seems visually more alive than to me than life. I often wonder why I draw and paint. Do I have anything worth saying? Your blog gives me a lot to think about. I do know that I am most moved to paint what I love and find beautiful and it is a form of praise. There are other motivations for me but this one is by far the most powerful. Kind of a catch-22 because these are the images that I am most uncertain about my ability. Thought provoking blog Judith.